After many, many hard nights of drinking and dancing at Araf Cafe in Istanbul’s Beyoglu neighborhood I had to have sustenance to sustain me inspite of the fact I was walking back to my hotel with little else to do other than collapse on the bed in a deep slumber. This is where Durumzade comes in. 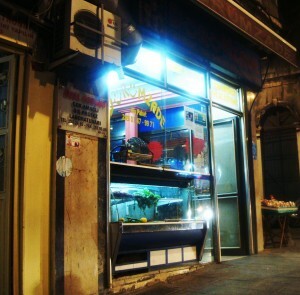 While there are durum joints all over town, this one shines particularly bright. You walk into the tiny, bright shop and select your meat from a cold case, the grill man then heaves a giant portion onto a white hot grill while you sit outside for some premium people watching. Turks love to party and at 3 or 4 in the morning the sidewalks are filled with people laughing and talking amongst themselves. It’s a very nice scene. Then the food comes and all bets are off. A durum is taxonomically similar to a burrito with lavash substituting for a tortilla. This durum is stuffed with expertly grilled meat [chicken or beef] onion, parsley and tomato. The lads that run Durumzade were featured on Tony Bourdain’s No Reservations tv show so one can imagine the lines are pretty long now but any wait you may suffer through will be well worth your while as this sandwich can lead you straight to the promised land. And it will set you back less than 4 Turkish lira. I’m not sure when you went to dürümzade last but it’s minimum 5 TL for a durum (tv show jacked up the prices), and many are much more expensive. I go pretty regularly and the durum are always 5TL (Adana, liver, chicken, etc). They’ve maybe gone up 1TL in price since last year? I don’t what kind of durum you’re getting for 10TL. Maybe the double? I was charged 10 tl for a modest durum during my February trip to Istanbul. It may have been in the same spirit of paying 30 tl for a taxi ride to Arnavutkoy from Beyoglu, on the return I traveled with an Istanbullu and was only charged 15 tl. RL as you suspect, some Americans have noted being charged 10TL and the Turk standing behind him being charged 5TL. Allegedly complaining will get you know where. Like Seinfeld “No Durum for you!” Out of principal, I am probably going to another Durum shop during my upcoming trip. Bourdain or no Bourdain, haven’t these guys heard of bad word of mouth quickly spreading across the cybersphere? Perhaps this is culturally naive, but I don’t think American customers in a U.S. food venue would let a foreigner be charged more. Even in a big city like NYC, where people tend to mind their own business.